In this lesson you will learn the difference between many prepositions of place in English grammar, including IN, ON, AT, BY, UNDER and OVER. 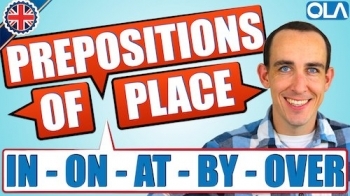 Students commonly make mistakes when using prepositions of place in English, and so we will look at the rules and some common examples of these prepositions in use. Keep watching to the end of the video for Greg’s interactive quiz! The fridge is in the kitchen. The flowers are in the garden. It’s raining so the kids are inside the house. The CD is inside the CD player. My bag is inside the car. My phone is on the table. The picture is on the shelf. The food is on the plate. ON TOP OF = The same as ON, but emphasising the top part of something. The magnets are ON the fridge, but the keys are ON TOP OF the fridge. The house is ON the mountain, but the cross is ON TOP OF the mountain. The shelf is above the plant. Your nose is above your mouth. OVER = Similar to above (i.e. at a higher level but not touching). However, we normally use OVER together with a verb. You have to fly over the Atlantic Ocean to get to America. I can see a rainbow going over the city. In tennis, you hit a ball over a net. UNDER = one object is covered by another. My legs are under the table. There’s a coin under my foot. I lost my watch under the bed. BELOW = The opposite of ABOVE. One object is in a lower position than the other. BENEATH = a more formal word for below. Used for a specific place. My daughter is at the swimming pool. If the pen is in front of the book, the pen is closer to you than the book. If the pen is behind the book, the pen is further from you than the book.